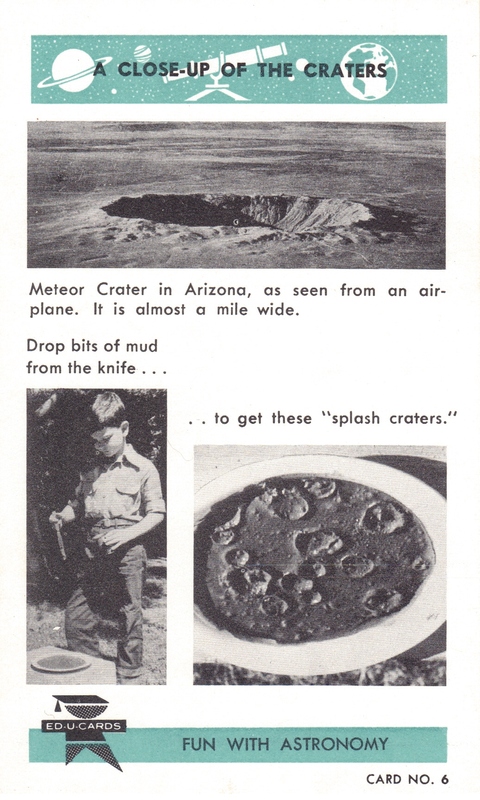 Let me take a minute or two to tell you why I was looking at Meteor Crater a few weeks ago. My motivation wasn’t linked specifically to observatories or instruments, but more to the historical ephemera of science and astronomy. But I’m a historian, so that’s okay. This is Card No. 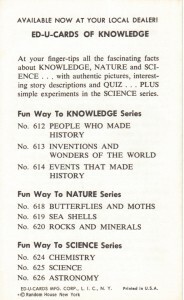 6 from the Ed-U-Cards of Astronomy published by Random House in the 1960s. 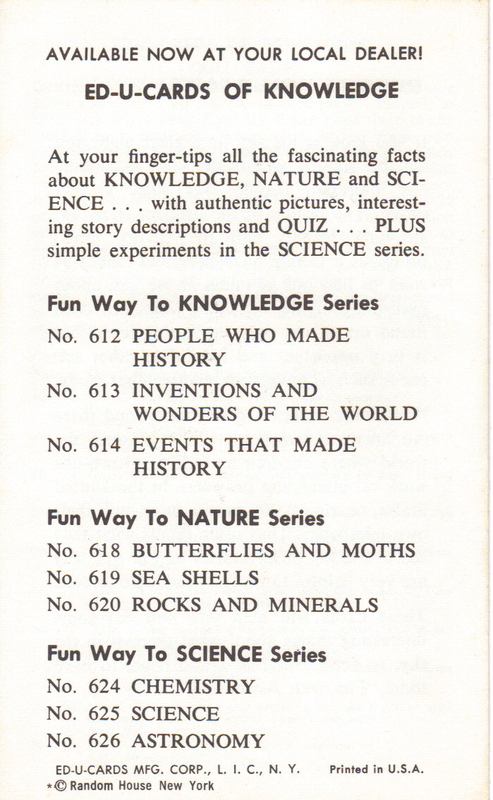 Random House pretty much had the science and entertainment industries covered with these card collections. 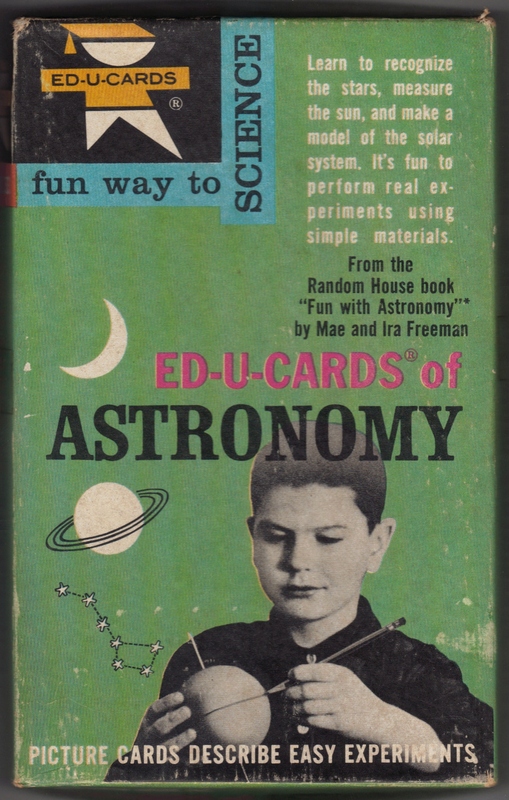 I’ve seen Ed-U-Cards of Science (Biology, Chemistry, Astronomy), Ed-U-Cards Baseball Card Game, Ed-U-Cards Book of Knowledge and Ed-U-Cards Quick Draw McGraw Card Game (which I totally want!). 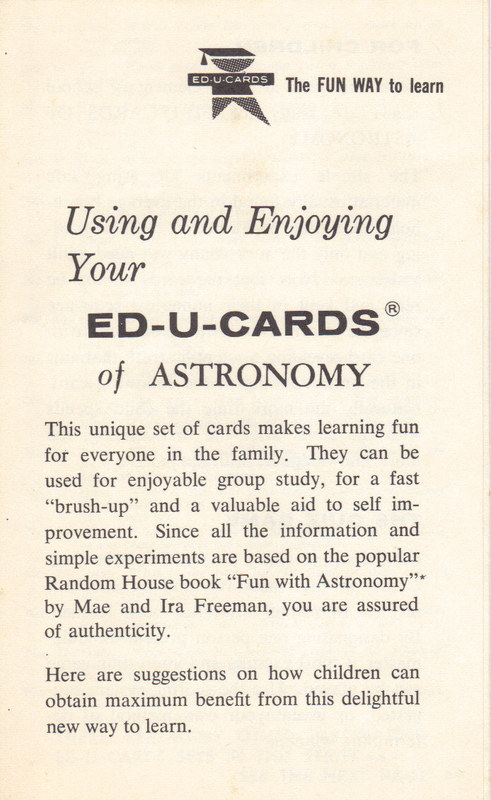 I happen to own the Astronomy set. Considering they were written in the 1960s, they’re amazingly relevant. 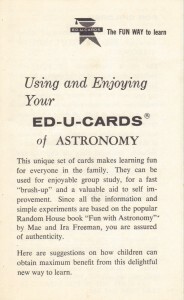 Okay, the card on the expanding universe doesn’t include new thinking about the moment of inflation or the competing theories on the expand/collapse of the universe. 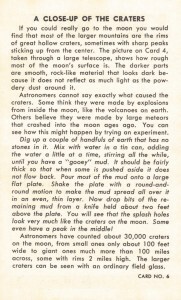 It did, however, include a description of the balloon experiment, which I found super useful as a youngster trying to understand the expansion of space. 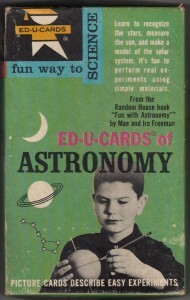 Most of the cards have useful activities for children: how to find Arcturus by using handle of the Big Dipper as a guide; how to recreate the phases of the moon with a ball in motion; how to draw a model of our solar system. 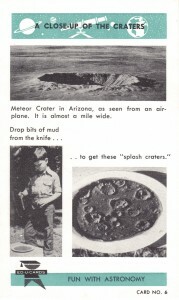 The front side of Card No. 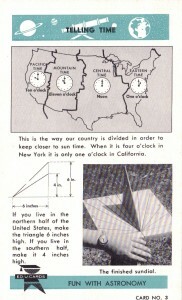 3, Telling Time, provides a graphic for U.S. time zones (drawn before the State of Indiana really messed things up for its citizens) and a picture of a rough sundial. 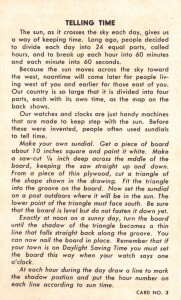 * On the reverse is a basic explanation of keeping solar time and instructions for making a sundial out of cardboard or wood. 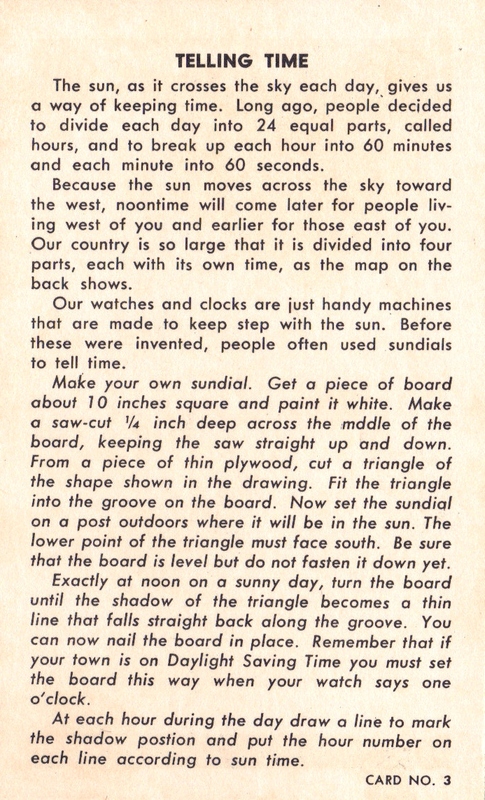 The sundial won’t be accurate to the second, or even the minute, but as I found out while constructing a model astrolabe, while you can buy a sundial off the internet, you’ll learn more if you build the instrument yourself. These cards are still available here and there. My word of caution: don’t buy them from the folks who are charging multiple dollars for a single card on E-bay. They are completely ripping you off. *You can tell the photos are from the distant past because the kid’s wearing a wristwatch, not checking his smart phone for the time of day. In honor of my recent visit to one end of the VLBA, I’m linking you to a beautiful photo of the VLBA telescope on Mauna Kea. Click on the image to access it in various sizes and to thank Troy Mason for making the image available through Creative Commons licensing. We started our summer vacation with a trip to the Very Large Baseline Array (VLBA), or I should say, one of the ten radio telescopes that comprise the VLBA. 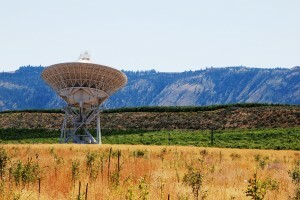 The powers that be at the National Radio Astronomy Observatory (NRAO) saw fit to place one of the dishes near Brewster, Washington, an act which positioned it directly on the path between the Spokane airport and my parents’ house. 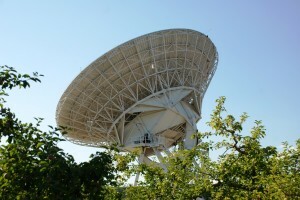 Dish with receiver, VLBA, Brewster, WA. Photo credit: JR.
At the moment, the VLBA is the world’s largest dedicated telescope array with the sharpest resolution. 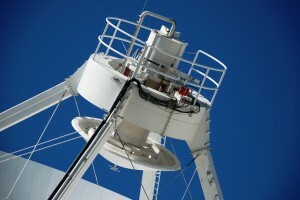 The telescope spans 5,351 miles (8,611 km), with dishes located near Brewster; Owens Valley, CA; Pie Town, NM; Fort Davis, TX; Los Alamos, NM; North Liberty, IA; Hancock, NH; Mauna Kea, HI; Kitt Peak, AZ; and St. Croix, Virgin Islands. 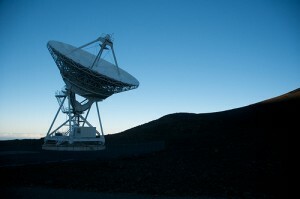 The ten telescopes—each with a reflecting dish, feed/antenna & receiver—are connected via transmission line and combine to form a massive interferometer with a spectacularly high resolution. 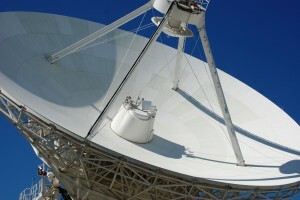 All the dishes gather a radio signal from the same object at the same time. When the received signal from one telescope is superposed with the next, and so on, the ten single telescopes function as if they were one massive instrument with a baseline as large as the greatest distance between dishes. 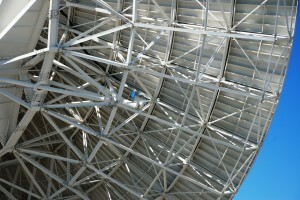 Some telescope arrays, like the Very Large Array (VLA), can change the baseline length, and therefore the resolution of an image, by relocating individual telescopes along tracks. The ten telescopes of the VLBA are at fixed points; they rotate, but don’t move horizontally. However, they can be asked to work together with other radio telescopes (Arecibo, Effelsberg, NRAO’s Green Bank Telescope or the VLA) to perform as the High Sensitivity Array. If you’d like to watch the Brewster telescope “in action,” NRAO provides a real-time feed of the instrument (refreshes every five minutes). 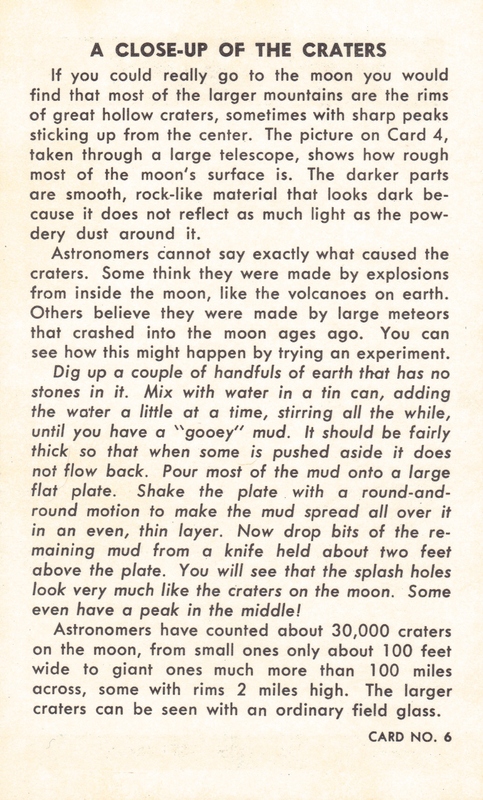 They’ve also provided a fairly lucid explanation of radio astronomy and some kind of cool movies of black holes as observed by the VLBA. And, if you’re like me, and prefer to follow inanimate objects on twitter, you can follow the lives of the telescopes @TheNRAO. There are thirty-two more photos of the instrument on my flickr site, including several that can be strung together in a slide show to depict the slewing of the telescope . Today’s wall paper shows the Cruz del Sur Observatory in Cerro El Peralito, near Combarbalá, Chile. 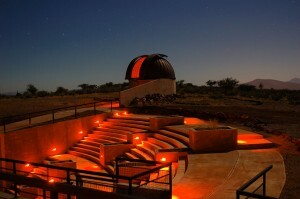 This observatory, which consists of four domes arranged to mimic the Southern Cross constellation, exists to spread the passion for astronomy in the local community. The domes pinning down the ends of the large arm of the cross house 16″ Meade LX200-R-type Schmidt-Cassegrain telescopes. 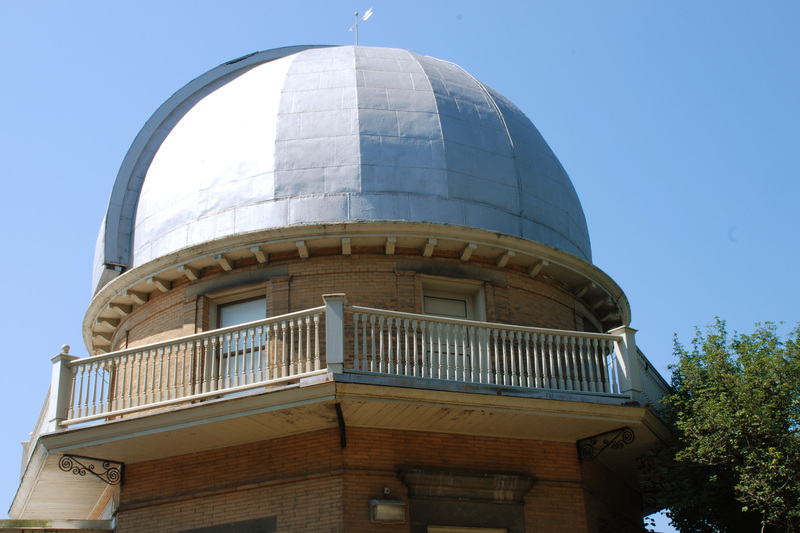 The domes anchoring the short arm of the cross house 14″ Meade LX200-R-type Schmidt-Cassegrain telescopes. Although visitors are required to book ahead and pay a nominal ticket fee, the observatory welcomes guests for tours during the day and night. Click on the image and look to the right hand column to download the image as wallpaper. New findings are in from NEOWISE, the Near Earth Object (NEO, typically a comet or asteroid) observing component of NASA’s Wide-field Infrared Survey Explorer (WISE) telescope. WISE is/was an infrared surveyor satellite set into polar orbit in 2010. 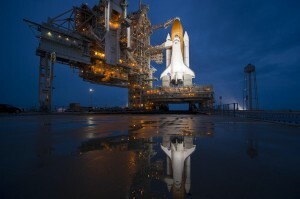 The spacecraft was designed with a limited life span of approximately ten months: one month for testing and checkout, six months for a whole-sky survey, and three months for a second survey meant to identify any changes that had taken place in the sky since the first survey. 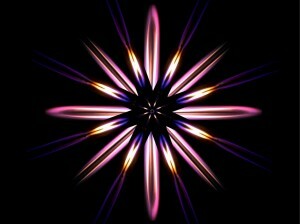 April 14, 2011 marked the date of the preliminary release of WISE data. The final release won’t happen for another ten months or so, but we already have some interesting results from released data. Today it was announced that Comet Hartley 2 is leaving a bumpy, pebbly trail behind it with grains as large as golf balls. The last time the comet was surveyed (November 2010, as part of NASA’s EPOXI mission), data showed that the comet was streaming golf ball- to basketball-sized fluffy ice particles. The NEOWISE results indicate that the smaller, golf ball-sized pieces survive farther away from the comet than scientists previously thought, comprising at least part of the comet’s debris trail. According to the NEOWISE team, larger chunks are less likely to be pushed away from the comet’s trail by radiation pressure of the sun. Since these observed particles are in the trail, they must be (relatively) small. The team was also surprised to note that Hartley 2 is ejecting carbon dioxide gas at a distance of 2.3 AUs from the Sun. Although EPOXI had detected carbon dioxide streaming from comet, it was at a distance considerably closer to the Sun. So, that’s two new things we know about comet behavior today that we didn’t know yesterday. Money well spent. An abstract of the paper, “WISE/NEOWISE observations of comet 103P/Hartley 2,” which has been accepted by the Astrophysical Journal, can be read online. If you have access, you download a .pdf of the entire paper. I travel a lot for work. * That can be a bad thing, in that I often miss sleeping in my own bed, but it can also be a good thing, because it gives me a chance to visit observatories that don’t necessarily fit in with my academic research agenda. 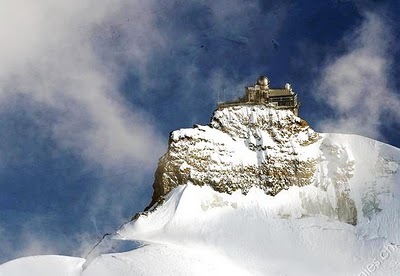 One place I’d really like to visit–but let’s face it, the odds aren’t good–is the Sphinx Observatory at the High Altitude Research Station at Jungfraujoch, Switzerland. With its 76 cm Cassegrain telescope and Coudé focus, the observatory operates as part of the solar spectrometer of the Institut d’Astrophysique et de Géophysique de l’Université de Liège, Belgium, and the LIDAR system run by the École Polytechnique Fédérale de Lausanne, Switzerland. I’ll admit that my interest in Sphinx is more about aesthetics and history than current science research. LIDAR (Light Detecting and Ranging) is interesting, although meteorology isn’t my field, and certainly solar spectroscopy would hold my attention. But what really attracts me about Sphinx is its location 3500 m above sea level in the Bernese Alps. Photos of Sphinx tend to emphasize the remote location and the extreme weather surrounding the observatory. The site looks pristine and almost primordial, as if humans had scarcely touched the mountain during the process of dropping an astronomical castle on its summit. For the most part, however, the photos are illusory. Don’t misunderstand me: working conditions at Sphinx are challenging. 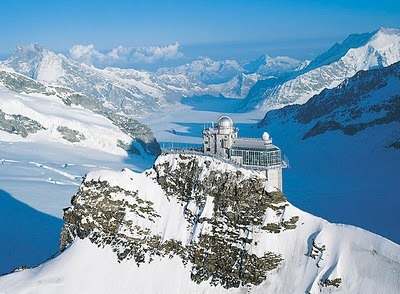 The regulations for the research station highlight some of the challenges, noting that, “because of the high altitude and the isolation, life and work at Jungfraujoch make great physical and psychological demands. Experience has shown that in general the researchers at Jungfraujoch do not have the same working capacity and are more irritable than at lower altitudes. If possible, researchers should not stay at Jungfraujoch for longer than approximately four weeks at a time.” So, that’s a serious emotional and physical commitment in pursuit of scientific research. The alpine weather can’t help much (check out the mountain web cam if you don’t believe me). Still, as beautiful as they are, the photos misrepresent the observatory just a bit, in that they mask the site’s accessibility. The observatory is accessible year round via the Jungfrau Railway and, in fact, it was because the railroad made visiting the summit so (relatively) easy that the mountain was chosen as the site for meteorological research. Discussions for implementing a research program began as soon as the railroad was completed in 1912. The research station grew in fits and starts for years, and the observatory wasn’t completed until 1937. The first dome was added to the observatory in 1950. 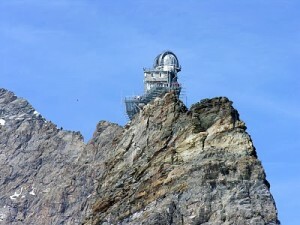 As it turned out, the need for astronomical observing was so great at the station that another two domes were added at the Gornergrat High Altitude Research Station (Matterhorn region) in the 1960s. 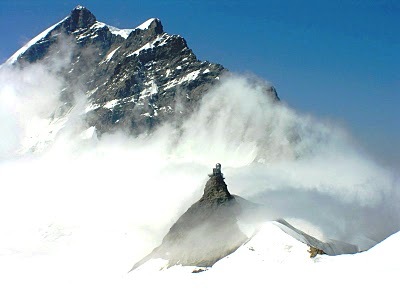 As the histories of both Jungfraujoch and Gornergrat research stations demonstrate, high altitude research is as connected to tourism as it is to science. While early explorations of the alpine region were driven by what we might call “scientific curiosity,” particularly the glacial and geological studies, the introduction of the railroad opened up the mountains to anyone who could afford to pay for passage. Hotel building at Gornergrat began in 1896, and when the railroad was completed in 1898, tourists flocked to the region. The Hotel Kulm Gornergrat was built between 1897 and 1907; today the hotel uses its immediate proximity to the research station as a draw for tourists. Visiting is still a matter of money: the roundtrip ticket from Zermatt to Gornergrat is 60 Euros; a double room at the Hotel Kulm will run you 167.65 Euros. You can eat fairly cheaply in the cafeteria of the Top of Europe Restaurant at Sphinx, but the Crystal dining room will set you back a bit more (I have no idea why they have a Bollywood room in the Alps). Some forms of leisure are just always reserved for the monied among us. 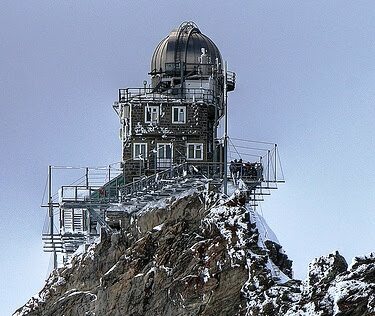 I can’t say that Switzerland has ever made my top twenty list of places I’d like to visit, but the photos of Sphinx Observatory are certainly making me reconsider my priorities. It’s going to require some serious re-working of my household budget, though. *A lot. In the past six years, I’ve spent fourteen months in India, three months in the United Kingdom, and two weeks in France, all in the pursuit of research. Other work-related travel conducted in the same time period has taken me to: Minneapolis, Madison (x2), Chicago (x4), Boston, Los Angeles, Austin, Washington D.C., Savannah, Pittsburgh, New Orleans, Philadelphia, South Bend, Princeton, and New York. 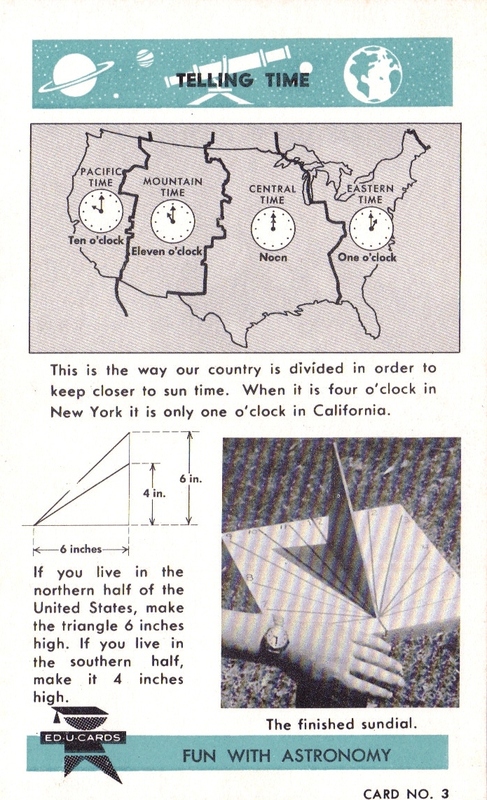 I’m not even going to talk about trips to visit family in Washington, Oregon and California. The University of Illinois Observatory held an impromptu open house last weekend, so we dragged a friend to campus so she could experience some sky-watching. She seemed genuinely thrilled by both the view of Saturn through the 12″ refractor and the view of the moon through a light bucket (1o” Dobsonian reflector) the UIAS had set up on the lawn to the west of the observatory. UIAS is a friendly group, and I highly recommend joining their listserv if you live in the area so you receive announcements about their open houses. The pendentives here are exposed brick, painted but not disguised with plaster. 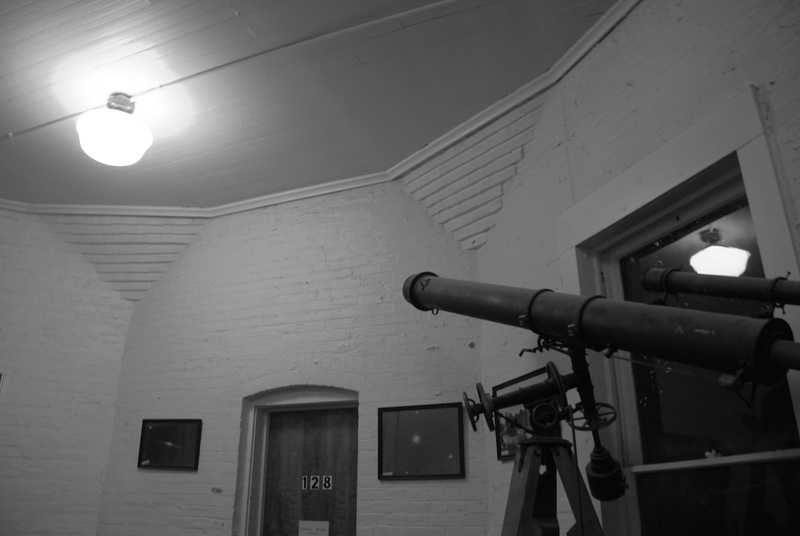 (As an aside, the photo above also shows an antique 6″ equatorial refractor.) 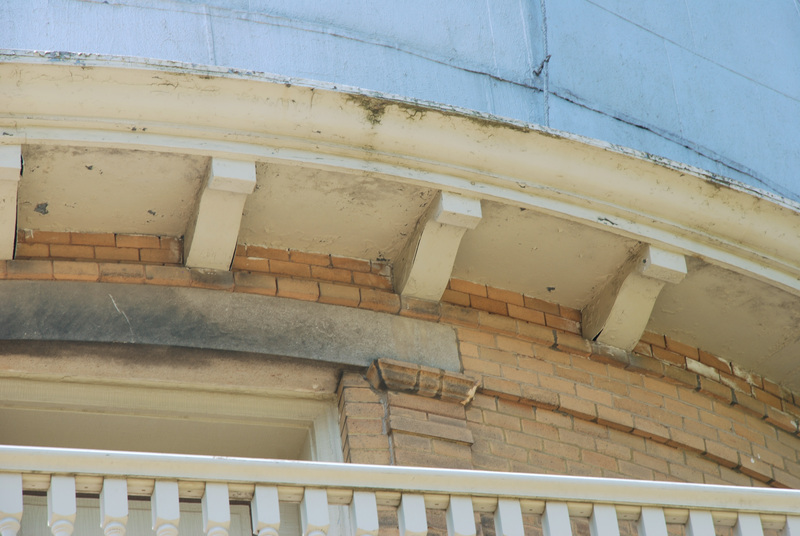 Before going upstairs, I thought to myself, “This is a very honest building.” The repressed brick out of which the walls and telescope were built is readily apparent. The warm temperature inside also was fairly honest. During the cooler evening hours, the masonry off-puts the heat it stored during the day, which would be a good thing if you were trying to heat the place, but is actually a bad thing because the radiation causes turbulence just when you want to start using the telescope. Most of the exterior materials are constructionally transparent. The walls are made of brick, the pilasters are made of brick, the door and window headers are made of limestone. The balcony railing is painted wood, the dome roof adequately expresses the shape of the interior of the dome. 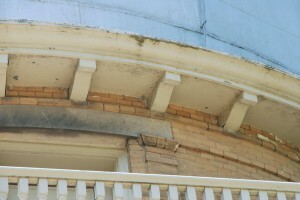 On the other hand, the brackets under the lip of the dome are completely decorative, having no real role in the support of the roof structure. Moreover, they’re not even wood, but sheet metal, crimped and folded into the curves. If you look closely at the brackets on the far left and right (click on the photo to enlarge), you can see they’re starting to pull apart. So, this is an interesting, but dishonest building, if you buy into the Modernist myth of materials necessarily expressing their function (which I only do on every other Friday). 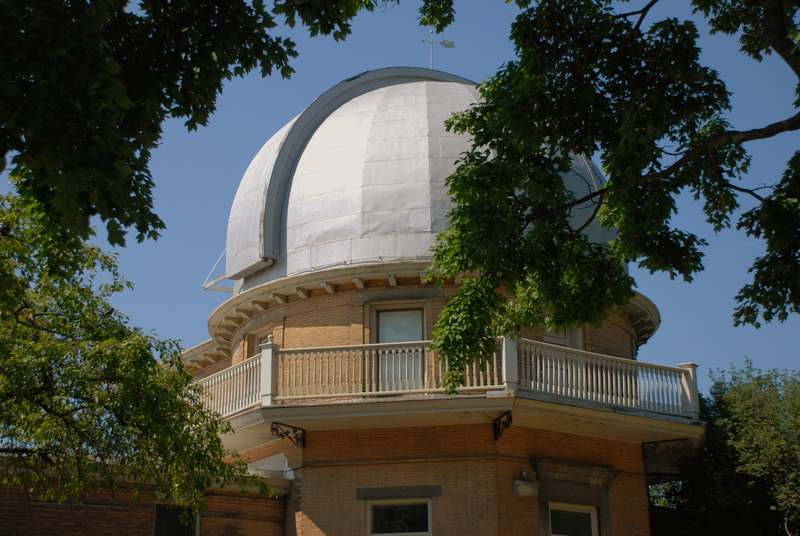 It’s quite different from it’s Big Ten counterpart, Kirkwood Observatory at Indiana University, despite the fact both observatories house 12″ refracting telescopes. One of the IUAS hosts offered to give me a tour of the building during daylight hours, so expect an entry discussing the instruments closer to the beginning of fall semester. In honor of today’s successful launch, I’m posting a link to NASA’s Image of the Day for July 8 2011. Enjoy!